The need for speed has always been a priority for IT leaders, and now more than ever. Unfortunately, most legacy IT organizations have mortgaged away speed with poor technical debt management over many years. Today, the level or risk lurking in complex, mission critical software is at an all-time high. With additional risk being introduced in every software patch and release by developers spread across complex sourcing and architectural landscapes. Testing, the traditional foil for software risk is not nearly enough to address structural problems that arise in live environments. CAST Application Intelligence Platform (AIP) is the most comprehensive structural application analysis engine on the market today. 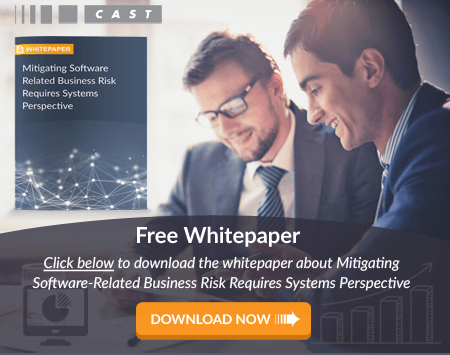 AIP creates a cross-application blueprint that enables identification of the most insidious software risks that result from complex integrations of multiple software components. AIP is either deployed as the structural quality gate portion of the QA process, in parallel to testing, or in the build process for fast feedback cycles. In both instances, AIP identifies software risks that functional testing, and even performance testing, cannot address. When it comes to software risk management, CAST AIP analytical capability not available in any other code quality product in industry. Deep understanding of a systems resilience and efficiency is only possible through an analysis of component interactions at the architecture and the transaction levels. Some key highlights of CAST AIP capabilities include.